When I first moved to the city, I landed in a pretty darn perfect situation. I spent my first six months here living with a friend in her gorgeous townhouse in Hunters Point, Long Island City. This place was equipped with the most amazing kitchen I have had the privilege of cooking in, and I put it to good use as I took advantage of all of the fresh, delicious foodstuffs the city has to offer. 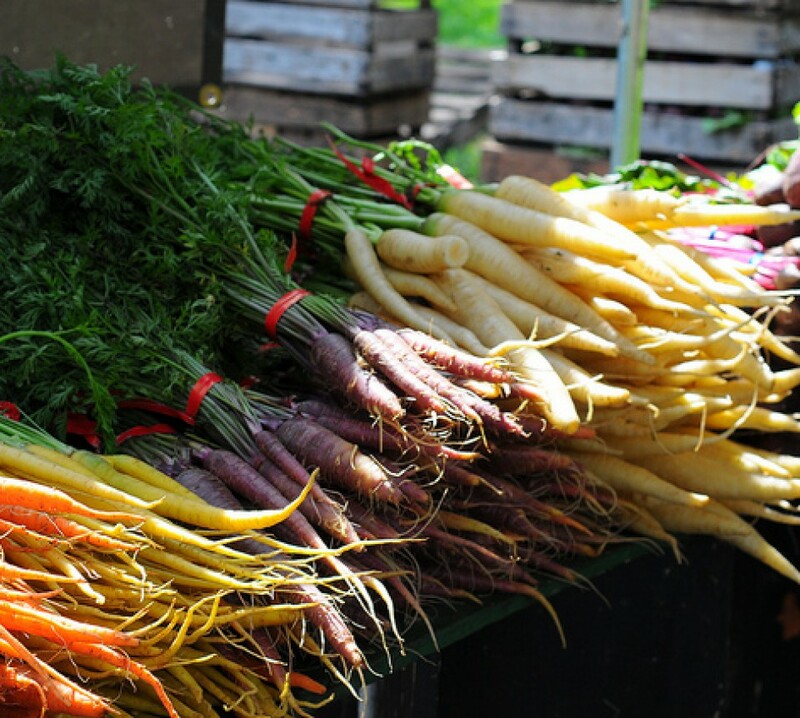 As any of you who have moved to New York from elsewhere know, relocating here can take a big chunk out of your pocketbook, so my dinners then were often even simpler than they are now, and usually more veggie-centric. 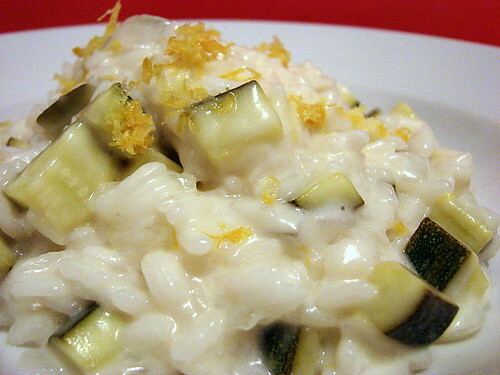 This zucchini and lemon risotto was a dish I made often, since my roommate and I always had a big bowl of lemons on hand, and a nice-sized zucchini would cost me a buck – if that – at the great little produce market just around the corner. Combined with fridge and pantry staples, it was a meal that was cheap, came together quickly, and was bursting with the bright, fresh flavors of summer. Mike and I always have a big bowl of lemons on hand in our kitchen in Bushwick, and I still love to make zucchini and lemon risotto. The version I made last night was a little richer than the version from my Long Island City days thanks to a generous addition of soft, creamy Mettowee cheese from Consider Bardwell Farm, but the flavors took me right back to those first giddy months of living here, the newness of it all, and the excitement of the possibilities that lay ahead. Melt 1 tablespoon butter into olive oil in a heavy-bottomed pan over medium heat. Add onion and a generous pinch of salt and cook until the onion is softened. Add the rice and stir well to coat with the butter/olive oil mixture. Cook until the rice starts to become translucent, then add vermouth and stir. Continue cooking until most of the liquid has been absorbed. Add lemon juice and zest along with one cup of water and again allow to cook until most of the liquid has been absorbed, stirring occasionally. 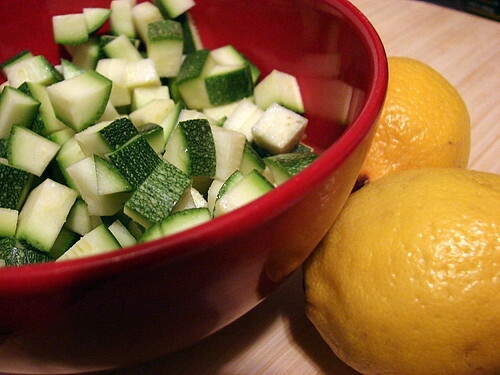 Add the zucchini and season with salt. Continue adding the remaining water a cup or so at a time, allowing the liquid to cook into the risotto as described above. You may need more or less liquid than I have listed above, but what you want is for the risotto to be creamy and the texture of the grains of rice to be al dente. Taste often as the rice cooks so you can monitor the texture of the rice, and also adjust for salt. Once the risotto is al dente, turn off the heat and gently stir in the remaining tablespoon of butter and the goat cheese until the risotto is creamy and the cheese is well-incorporated. Serve in shallow bowls with additional lemon zest on top. Your inspirations are always timed perfectly for what is coming out of my garden. I am experiencing a zucchini excess currently and am always looking for creative ways to prepare them. This recipe looks perfect! Thank you! This sounds deliciously simple, Jennifer. The lemon juice and zest makes me think it would be nice and bright and summery. And seeing as how you said “stir occasionally” [rather than “stir constantly”], I might even give it a try. Cooking risotto never seems difficult to me, just tedious. I hope you have been feeling better! It seems nice lemon flavor. Somehow, It reminds me preserved lemon. I haven’t tired it yet. It’s said that preserved lemons is used in Moroccan dish. You can make it by yourself too. just marinated lemon with salt for a while. I’ve found a recipe here. I wanna try it when I have time. Terry – Sometimes I think not stirring risotto constantly makes for a better texture. I think one of the reasons it’s such a fallback dish for me is because it’s so easy. Give it another shot! Hillary – Thanks, I’m feeling better and better every day! hikalu – I have never made preserved lemons but have been wanting to try for a while now. If you beat me to it, let me know how they turn out! i might try this one tonight. i’ve got all the ingredients on hand. i know this is shocking – well maybe not shocking to you as you’ve no idea who i am – BUT i’ve never made risotto. ever. but i did buy a fancy box of it a year ago from williams sonoma that’s been sitting in my pantry and i’m thinking tonight’s the night. ok – i did it. yes i did. it is done. leftovers are in the fridge. and it was good. really nice. but mine was maybe a little gluggy – or something. i mean, your pic looks soooooo pretty. my pic is gonna look just a bit scary in comparison. plus i was down to my last 2 lemons so no zest to garnish. but anyway – the flavor was good. my zucchini was chopped a bit smaller so it’s not as noticeable (and again – not as pretty) but i used more because the zucchini i used was bigger than 2 chopped cups and i figured no harm done. sooooo… it was an exercise in risotto. i aspire to do better the next time but in the meantime it was a good dinner and we had fun and i love your blog because you just “get food” in a way like to think i do but don’t…. I tend to leave my risotto just a wee bit on the soupy side at the end because it does sort of “set up” while I’m taking my photos. And honestly, risotto is something I really think you just need to do again and again until you get a feel for it. Heck, I feel like I’m still honing my technique! I’m generally a terrible cook, but the photo of this dish was so tempting I made it for dinner this evening. We don’t eat a lot of cheese so this was a real treat. However, never having made risotto before, it came out tasty, but pasty/dry. I need to figure out how to keep the dish moist through the very end. I didn’t use enough fo the water for fear of making the dish too watery, but ended up doing the opposite. The lemon flavor was delicious, though. Glad to have tried this, thank you so much! Thanks, Stephanie! Risotto does tend to seize up a bit as it cooks/cools, so like I mentioned above, I do tend to leave mine a little bit soupier so that it doesn’t dry out. It’s really trial and error, so I’d definitely encourage you to keep experimenting! Jen, I used this as inspiration last night. I used yellow summer squash instead of zucchini and added bacon — and used the bacon fat instead of the butter and oil. Thanks!